When Valve cancels your Major status, give away gaming chairs! Well played, Galaxy Battles 2! From branch to radiance real quick! Galaxy Battles 2, the once Major tournament that was supposed to be the first DPC Major of 2018, is happening this weekend and despite the bad publicity, the show must go on. 8 teams have soldiered on to provide a show to the passionate Filipino fans and with Eri Neeman as the host, you can be assured of a good time! A refund was one of the requests of the public, since the former glory of the event has been reduced to a shadow of its former self but Galaxy Battles has responded in the most awesome way possible. During the event, a portion called “Refund or Chance” was held and it was basically a chance for a lucky audience member to get a refund for his ticket or a chance to win some awesome prizes courtesy of the organizers and the sponsors. Clifford, the lucky contestant, showed up and was given center stage to make that choice. With further coaxing by his friends, the audience, and Eri, he made a choice, which you can see in full here. What happens next, well, you can check it out below. Now as you can imagine, Clifford was HYPED. 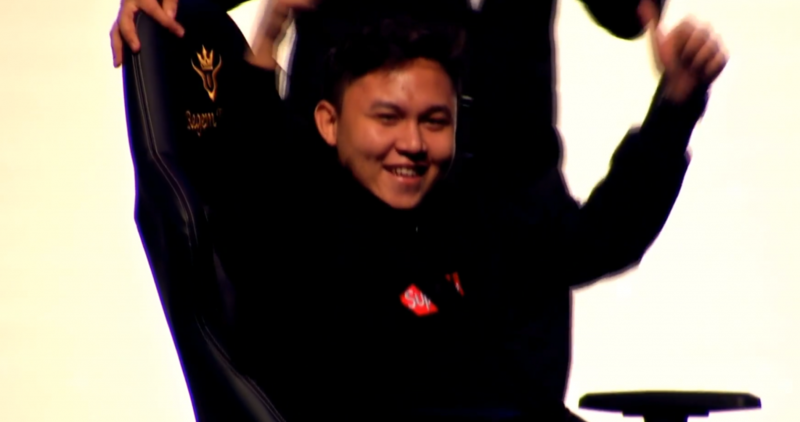 He paid a couple grand to go to the event despite the unfortunate series of events that happend, got to view great Dota 2 games, AND goes home with a brand new gaming chair! Can’t get any better than that, right? You can see the moment of triumph here. Look at the smug face, that’s the look of a winner. Hey Galaxy Battles, well played! If you’re still having doubts and want to catch the tail end of the event, the last day of Galaxy Battles happens tomorrow, January 21, Sunday. Head on over to your nearest SM ticket outlets and catch the final set of games tomorrow to find out who wins the grand prize and title of Galaxy Battles champion. Who knows, you might be able to take home a gaming chair too! Rooster Teeth at Fan Expo 2018!